Get fit for less: be careful what you wish for! Running shoes in cleaner days, before recent mud and rain. Back at the beginning of the year, getting fit for less topped my list of five fabulously frugal New Year’s Resolutions. Even though I am hardly a natural runner, I reckon running is a good bet for exercise that takes limited money and less time. Basically until some scientist can come up with a form of fitness that takes place while I sleep, I’m stuck with running. 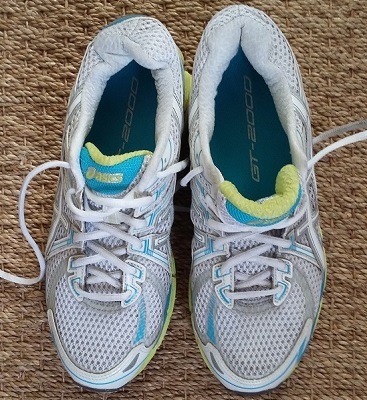 I resolved to have another go at Couch to 5K, which is a nine-week running programme designed to take complete couch potatoes (ie me), get them out running three times a week, until they can run for 30 minutes straight. I did the programme last year, and then a couple of free 5km Park Runs, but what with one thing or another, I let it slide. So the good news is that I’ve managed to extend this fit of enthusiasm beyond the first few days of January. I’ve been heading out roughly every other day and rewarding my inner five-year-old with stickers on the family calendar. You can even follow my progress over on Twitter, where I post a #Couchto5K tweet every time I stumble back from a run. Yesterday I finished the third run on week 6, which involves staggering along for an entire 25 minutes straight. Given when I started last month it was a bit of push to run for 60 seconds, I’m still not quite sure how I managed that. And the ‘be careful what you wish for’ part? I do rather like free stuff. And I do rather like entering competitions. Mostly I just fill in my details, enter the competition, and forget about it, but I figure you’ve got to be in it to win it. And sometimes – just sometimes – I do, whether it’s a free book from Mumsnet Books Club mentioned yesterday, or an amazing manicure / pedicure / London hotel stay. Anyway, I was casting around for ways to keep myself motivated once the nine weeks of Couch to 5K finish, so I didn’t just let any exercise drift again. 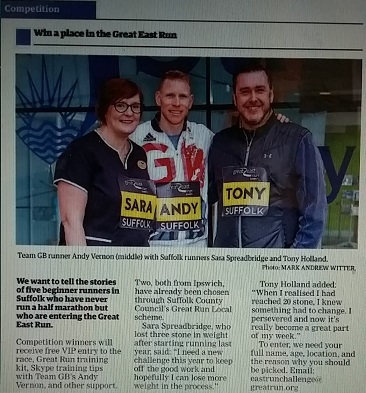 I was reading a free copy of the East Anglian Daily Times which was put through our letterbox, and had a whole big spread about the new Great East Run, which will be taking place in Ipswich in September. And there was a competition specifically for beginner runners who have never run a half marathon before. Five prizes were up for grabs with free VIP entry to the race, Great Run training kit, Skype training tips with Team GB’s Andy Vernon and a cryptic reference to “other support”. Competition in the East Anglian Daily Times – what have I done??? So I bunged off an email with the details requested, and I’ve only gone and won a place on a half marathon. Eeeek! That means running for 13.1 miles, which Google assures me is 21.1 kilometres. It’s also more than four times further than I’ve ever run before, and gracious that 5K seemed pretty tough at the time. So somehow between now and 24 September, I need to be able to run a half marathon. While that’s not a completely insane timetable, it’s still going to be a massive stretch. At least it has been a cause of great amusement to my nearest and dearest, although my star husband has said he will run it with me, and my mate Rach might even make it to Ipswich too. And tomorrow I have to show up at Needham Lake before the weekly Great Run Local, to meet the other winners and have our photo taken. Double eeek! There are two runs afterwards, a 2K and a 5K, and given I don’t think I can manage as far as 5K tomorrow goodness knows how I’m going to cope with 21.1K come September. But hey, I saved £30 on race entry and might get a free T shirt, to go along with the blisters. So there’s that. Anyone else ever bitten off rather more than they bargained for? Or feel like running the Great East Run with us? I reckon we could do with the company! Thanks so much for commenting Hawaii Planner, that's very inspiring and gives me hope I might yet managed it. Staggered round a 5K course this morning, after meeting the other Great East Run Challenge winners, and gracious my calves are aching! A half marathon seems a huge distance right now. Good luck with lupus, must be very tough. After signing up for my first marathon, I got nasty shin splints in both legs. My Dr. would only let me walk my training. It took FOREVER to walk 20 miles. He gave the okay the week of the run. I was going to stop at the half, but the bus was nowhere in sight. I even waited about ten minutes. I finally decided I may as well run it. I could barely walk the next day but I'm so glad I did it! It's such a feeling of accomplishment! I can't run anymore and miss it terribly. You can do this! Love the idea that you waited for a bus, I can totally imagine getting fed up and doing that. I am in awe that you completed the course despite painful shin splints interrupting your training. Thanks for the encouragement!